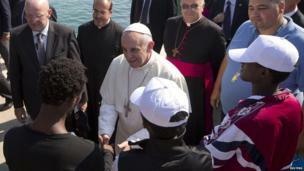 Pope Francis has made his first pastoral visit outside Rome, meeting and praying for illegal immigrants on the Italian island of Lampedusa. 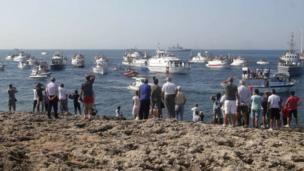 Residents of the tiny Italian island of Lampedusa greeted the arrival of Pope Francis, on a coast guard vessel (centre). 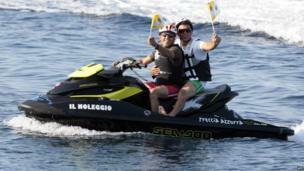 Many of those with the means took to the water to give the Pope a warm welcome. 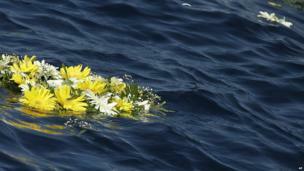 Pope Francis threw a wreath into the water in memory of the many illegal immigrants who have died trying to cross the Mediterranean to Europe. 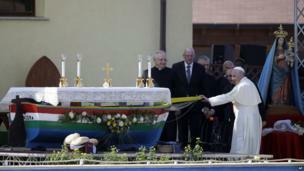 The Pope rode in an open-topped car in Lampedusa, rather than the Popemobile, while travelling across the rocky outcrop. 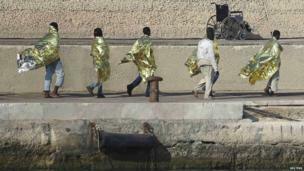 Just before his arrival, a new boatload of immigrants - described as 162 Eritreans - was brought ashore. 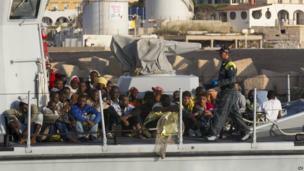 Lampedusa is just 120km (80 miles) from Tunisia and the first port of call for thousands of Africans hoping to make a new life in Europe. 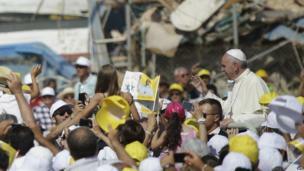 Pope Francis met some of those who had survived the trip. He challenged everyone to take responsibility for the migrants' desperation. Saying Mass on an altar converted from a migrant boat, he prayed for immigrants and thanked those in Lampedusa who had helped look after them.